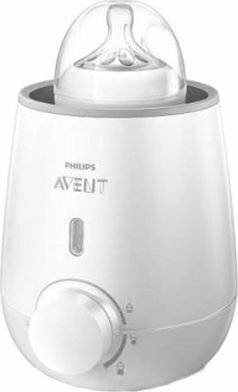 For days when you're rushed off your feet, this Philips Avent baby bottle warmer warms your milk quickly and evenly in just 3 minutes. Easy to operate, it features a handy defrost setting and can also be used to warm baby food. The bottle warmer will warm 150 ml/5 oz of milk in just 3 minutes. The bottle warmer features a handy defrost setting. Safer than defrosting in a microwave and more convenient than using water, simply select the setting to defrost frozen milk to liquid.